Let’s use the computer to help figure out how best to fit the scraps into the bus, shall we? If you’d like to play along at home, the drawing file is available for download at the end of this post. I’d love for someone to come up with a better plan than I have so far. The gridded part of the drawing is the main floor area of the bus (omitting the area under the driver’s seat and forward of the front door), with the front of the bus at the top of the drawing. The dark rectangles are obstructions — kitchen cabinet in front and toilet riser in back (not to be carpeted) and wheel wells in the middle (requiring more than just laying carpet flat over them). The dotted line in back is where the bathroom wall will go. The carpet pieces are light brown, oriented in the direction of the nap, and translucent on the drawing so we can see how they overlap. The large piece already set in the back of the bus is … already set in the back of the bus, cut to fit around the toilet, and slit to fit between and over the wheel wells. The dark brown areas in the upper corners are the translucent carpet piece overlapping the charcoal wheel wells. This slide is the “kit” with which to start. I expect to have bunks or desk filling most of the wall space in the main room (like the kitchen already does); so the center aisle will remain the primary walkway. I (virtually) took the long strip from the left, laid it down the main aisle, cut it to length where it met the piece already set in the back, then sliced that cutoff down the middle and used the two pieces to fill the front passenger side and the middle driver side. I changed the color from light brown to eye-catching-ugly to designate it as a set of pieces that had been cut. The thin, dark areas are where pieces overlap (translucent in the drawing, remember) and would be cut to fit. This has the advantage of not having a seam getting walked on all the time. It has the disadvantage of requiring two seams the length of the entire forward area of the main room. I cut the long piece in half lengthwise and seamed it together, which only requires one long seam. The design is symmetrical but in my opinion not particularly helpful. It requires several more seams (both horizontal and vertical) right at a high-traffic chokepoint between the wheel wells. And it has a seam right down the entire main aisle. This still has a seam down the main aisle but reduces the seams in the wheel-well area by not arbitrarily choosing to cut the long piece into equal lengths. I might be working on this tomorrow (Saturday). Comments and suggestions welcome. Here’s the file in OpenOffice/LibreOffice Draw format. Still waiting on brake repair but can’t let the world pass by while doing so. Thanksgiving Day and my family takes the evening meal together. 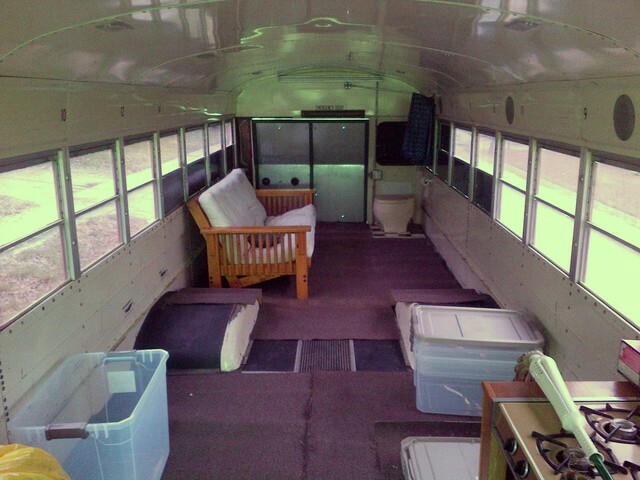 What better opportunity to clean the preowned carpet that I want to install in the bus? It was tricky running the Rug Doctor up and down those bumps up front, but well worth it. I did three full passes over all of the large and small carpet scraps, got really tired of running in and out of the house to empty the extraction tank and mix more cleaning solution, and was still pouring fairly-dark grey water out of the tank after the third pass. But that’s enough; I’m done. The carpet is now rid of obvious dusty and dirty spots and is a uniform color and texture. It’s also further relaxing its bends from being rolled up in storage. It’s 50F outside somewhere near here; it feels like 60F outside here in the still air; and it has to be 70F inside the bus with a clear sky and the sun shining down. The front door, back hatch, and all the windows are open and a breeze is blowing through to dry the carpet. $25 to rent the machine, $6 for a bottle of pre-treatment spray that I don’t think really did anything over as large an area as I used it, and $13 for the jug of cleaning concentrate. 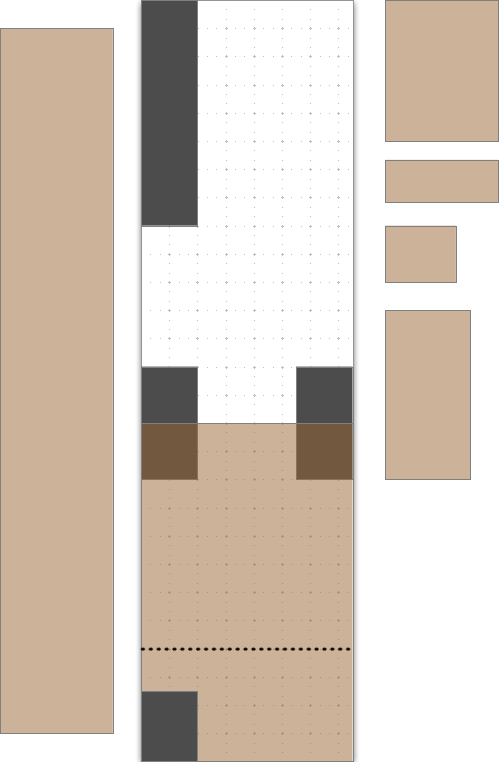 Now make a computer model of the floor of the bus and of all the carpet scraps so I can see how best to fit them in. And as soon as they’re dry, borrow my brother’s carpet seamer and start cutting them to fit and piecing them together. I’ve just come inside from my first night sleeping in the bus. It was a trial run in my own driveway to find out whether I needed anything more than the futon, a bottle of water, and a reading light in order to spend the night. Answer: I really don’t, but I learned several important things from the experience. When I had the bus parked on the street in front of my house over spring break, I noticed a lot of vehicles driving by slowing down to gawk at it. Yes, it was a large obstacle parallel-parked on the street; but you can tell the difference between slowing down to get around an obstacle safely and slowing to a crawl, sometimes stopping altogether, head(s) turned to look. Friday of that week, the police chief stopped by to visit with me about the bus. My mother worked for him when she was city office receptionist and court clerk, he’s an old friend of the family, and he’s very considerate, so this was not a stressful experience for me like it could be for some. You can’t park a big purple bus on the street in front of your house. It creates a traffic hazard. This license plate is expired and belongs to a 1986 Chevy and you can’t move another license plate onto a bus like that. I explained that I had the bus there to work on during spring break and that I was planning to take it back the next day, that it really is a 1986 Chevy, and that it really is currently tagged and insured but I haven’t been able to find the 2012 sticker for the license plate. If your converted bus is lawfully registered, tagged, and operable, you can park it on the street. We would prefer that you don’t because it causes congestion and a potential traffic hazard. Will rely on your good sense to decide. I appreciate the direct yet polite approach and resolved to do what I could to keep the bus off the street — which meant backing it into my driveway. I frequently backed the bus onto the concrete pad at my brother’s property, parallel parking close to the shed — but that has a long approach and plenty of room to correct. With the long distance behind the rear axle and the broken right-side wide-angle mirror, I was concerned about getting my angle right to back into our single-car driveway. With the long distance behind the rear axle, the doesn’t-seem-steep-in-a-car driveway and crown of the street, and my experience gouging the street with the back of the bus backing it out of my driveway, I was concerned about scraping on the way in. The solution to both problems was getting the back wheels onto the corner of the “alluvial fan” at the bottom of my driveway while the bus was still angled, then straightening quickly. And this required a better view of the right rear wheels than I thought I had available — but I practiced backing the S-curve into my brother’s alley near where the bus parks and that went well. At home on my own driveway, I got the wheels almost exactly where I wanted them and pulled forward a bit to straighten once, though I think I wouldn’t have had to. Lesson learned: Backing the bus takes less practice, on top of my experience backing other moderately large vehicular combinations, than I had guessed. With the bus in position, I started readying it to sleep in. The futon had been folded flat into a queen bed and I folded it back up to a couch/twin, to see whether it would work for me to sleep on while taking up less floor space. I brought out my sleeping bag, pillow, and book, and I set up a makeshift lantern out of a secondhand 12V AGM battery and an LED panel so I’d have a reading lamp that (A) wouldn’t drain the bus’s starting battery and (B) I could turn off when I was ready to sleep without getting out of bed to go to the switch panel at the front of the bus. All of the purple except the sleeping bag is from the window tint, of course. Most of this arrangement worked well, but I quickly found myself dissatisfied with the slope of the futon bench and got up to lay it flat into a queen bed again. This was an extremely important finding, because one of the things I most wanted to learn from this trial run was how I’d react to the bus being parked on non-level ground. Purpose-built RVs have hydraulic jacks to level the RVs and stabilize them from rocking while parked. The bus doesn’t have levelling jacks, and I’ve wondered whether I’d need to add some — whether I’d mind it being parked on a slope or rocking while guests are moving around in it. The angle of the futon seat is steeper than that of any slope I’m likely to park on — but given my discomfort, I think I should at least look into the stackable levelling shims that you can set in front of your wheels and drive onto. Lessons learned: Don’t sleep on the futon in couch configuration. Look for some means to level the bus when parked for night. At some point during the night, I thought I noticed a smell of diesel fuel inside the bus, which doesn’t make much sense as it has a gasoline engine. This morning I figured out the only likely cause — the futon was in storage next to an armchair my uncle and aunt discarded after a kerosene jug leaked onto it during their interstate move (and my brother thought he might eventually want the chair). Easy enough — finish cleaning the futon mattress and wait it out. I also keep a package of eucalyptus in the bus and rather like the smell it imparts, even two years old. I’ve previously used the bus’s dome lights for work lighting in the evenings and noticed them getting considerably dimmer as the evening wore on and they drained the (not huge) battery. That’s why RVs have separate starting and house batteries; but I haven’t yet set up a house battery and separate wiring. My LED reading lamp worked very well. After an ice storm, I had previously used the same LED panel with a smaller, 7.5 Ah battery and left it shining all night with minimal dimming, so I expected good results from the lamp. It doesn’t provide as much overall illumination as the dome lights — but I intended it for task lighting, and it performed admirably. This validates my plan to use warm white LED spotlights for reading lamps. Lesson learned: LED lamps are easily bright enough for reading and impose much less drain on the battery than the dome lights. I heard quite a bit of noise from cars driving by, and once from people walking by, until I fell asleep. I actually got up at one point thinking I must have left a window open, but it was not the case. I’m surprised how little the bus attenuates external noise, and I’m not sure it’s practical to cut that down much. Lesson learned: If parking in town, be prepared for city noises. I also had a fair bit of light shining in, from our porch light, the neighbors’ driveway light, and cars driving by on the street. It didn’t bother me much and I’ve already intended to replace the purple window tint with mini-blinds, which give a wider range of choices for view and darkness, but it could bother some guests. Lesson learned: Until I install blinds and a windshield screen, be prepared for light at night. I normally sleep on a (firm) waterbed, and when I sleep in hotel beds or on friends’ floors in a sleeping bag, my hip joints usually hurt by morning. Sleeping on the futon was no exception; so for my own comfort, it’s fairly important to build a dedicated bunk with the right cushion for me. 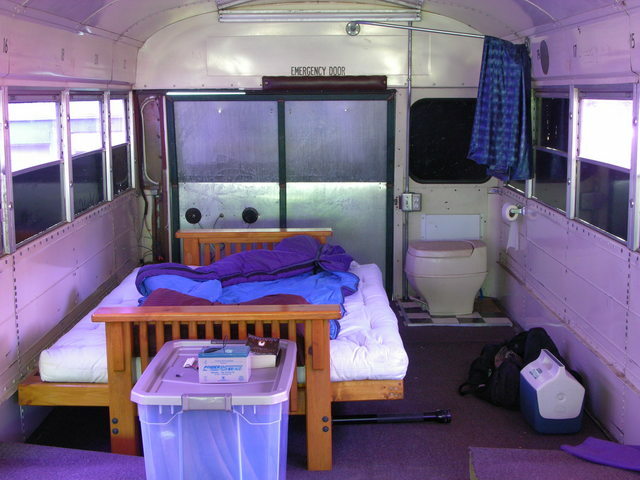 This will suit my purposes anyway, as the futon is wide, taking up fully half the width of the bus even in couch configuration, and angled, making it difficult to secure to the wall for travel. A slim bunk firmly attached to floor, wall, and ceiling will meet my needs and take less space. Lesson learned: Building a bunk will probably make the most difference for my next night in the bus. The orange line is the outdoor temperature, pulled from the nearest METAR station; it was about 40°F when I woke up. Outside and in the bus. And I like it. And my friends most likely to travel with me like it. And I hope to travel mainly in cool spring and fall, plus to cool altitudes, so I can expect a lot of it. But not everyone would like it. And I know the windows rattle and don’t seal well. And the floor is thin, though the carpet helps some. One can always open windows if it’s too much warmer inside than out, so it’d be nice to tighten it up a bit. On the other hand, for this bus and how I want to use it, I don’t think a full-scale insulation job is worth the effort. Lesson learned: Improve the weather sealing wherever feasible. Ultimately I want to have a soft but sturdy cream-colored carpet in the bus — and yes, I’m well aware of the challenge of keeping a light-colored carpet clean in an RV. That’s actually part of what I’m interested in about it — I don’t want the bus, in spite of its humble origins, to be shabby inside. I want it to be nice inside, and I want to treat it as though it’s more like a great hotel room than a tent. But the bus isn’t ready for great carpet until it has furniture and a bathroom and a kitchen; and I want to be using it already before all that’s done permanently; and I had some industrial carpet from a former job that (if I remember correctly) had been in service for something like a month between a roof leak that destroyed the old carpet and a planned redecoration. 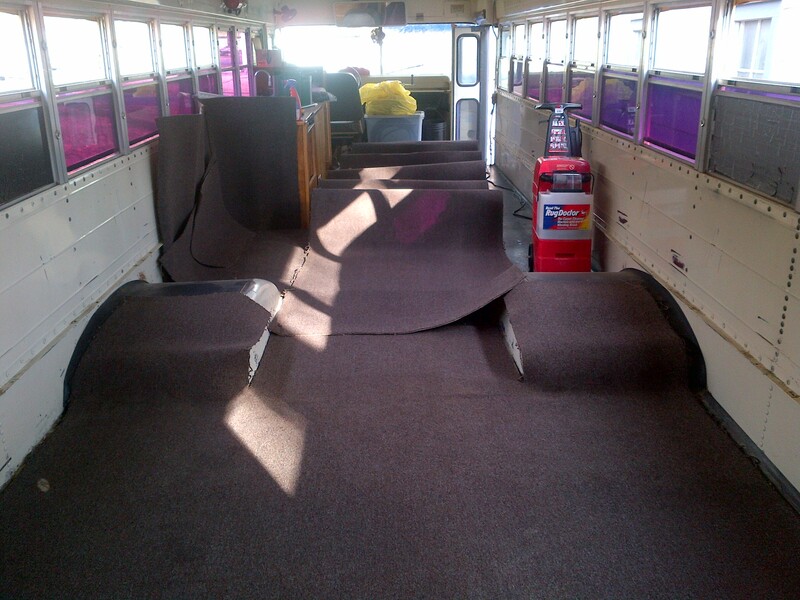 It’s not a great carpet; it’s better than not having carpet; it’s in reasonably good condition other than having been stored in dusty locales for a decade; and I can’t think of a better use for it than serving temporarily in the bus. Over spring break I fetched the carpet and unrolled it inside the bus to start to relax out the curves from being rolled. One piece is just barely narrower than the bus and fits from the back up to the wheel wells. Another piece is almost as wide as from the starboard wall to the port side of the aisle — but I think I’ll actually splice this so I can have the whole floor covered. It’s not really purple, nor dark mauve. It’s brown. The window tint is purple. GAHH. Looking back a day later, after rough-cutting to fit the wheel wells and carrying the futon back in (prematurely, as it’s way heavier than I remember and makes it very awkward to adjust the carpet position), you can see how the seams may come together (though without the gap between the wheel wells). And I learn that my brother has a seaming iron and some leftover tape, which is great! I can practice on this free, cheap carpet before doing the real thing. I will need to clean the carpet — it’s a bit tacky. My best plan is to get it seamed together so it’s a little more rigid, then rent a carpet cleaner. I’m open to suggestions from anyone with experience, though. 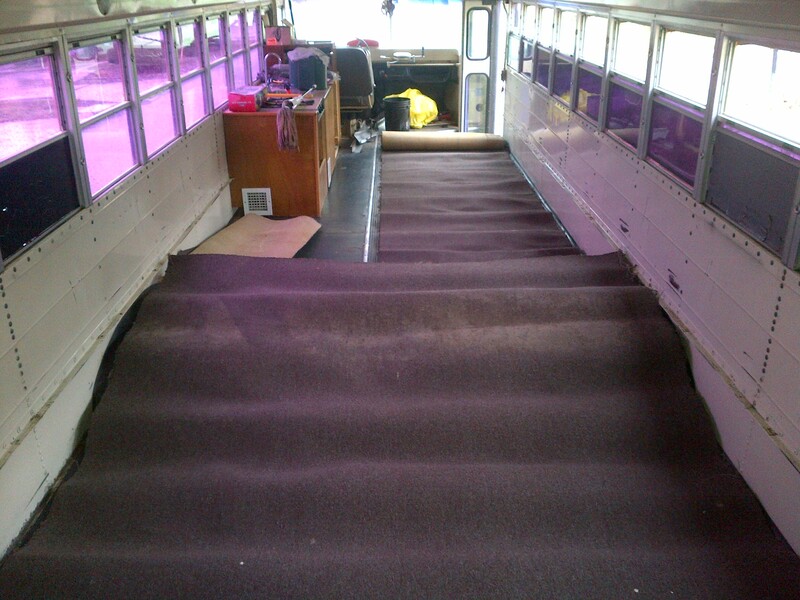 Also open to suggestions on how to “tack” down the carpet at the edges and ends of the bus. With this one, at least, I don’t intend to go as far as using a carpet stretcher and tack strips. But I should do something at the front and back to cover the cut edges and anchor them a bit, and I haven’t yet figured out how to go about that.